Note: This post also appeared on Waggener Edstrom’s Thinkers & Doers blog. Though brandjacking is certainly not a new concept, it’s one of those words that can quickly ignite panic in the world of social media. Unfortunately, brands, people and products are brandjacked every day. With the lightning pace and ease by which online presence can be established and content shared, online reputation management has become more important than ever. 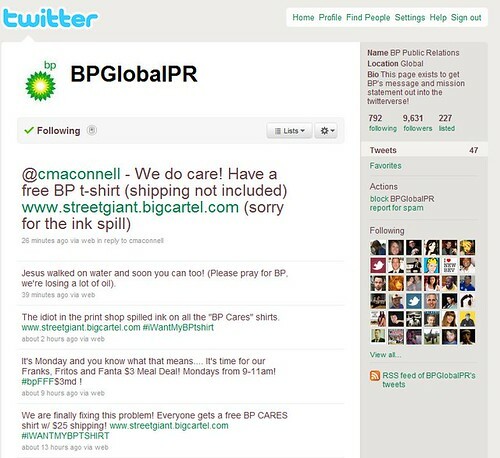 BP has quickly become the latest big brandjacking victim with the launch of @BPGlobalPR — a rogue Twitter account that is claiming to be BP’s PR department pumping out snarky tweets about the Gulf of Mexico oil spill. Tweets such as the one above are pulling in hundreds of followers by the minute. When I started drafting this post, the @BPGlobalPR account displayed 7,925 followers. 15 minutes have elapsed and the account currently has 9,000 followers. The account launched on May 19. Yikes. One would hope that whoever manages BP’s official Twitter account (@BP_America) has some type of listening and monitoring process in place and is by now well aware of the @BPGlobalPR account. That being said, here are a few immediate steps that BP should consider taking … pronto. 1. Contact Twitter. Though still in beta testing, the announcement of Twitter’s Business Center is proof that Biz and the boys recognize the important role that their platform plays for businesses, and vice versa. This isn’t the first case of brandjacking and certainly won’t be the last. Given the national spotlight on the oil spill, chances are good that they’ll be sympathetic toward helping BP get their ducks in a row and shut down the @BPGlobalPR account. 2. Acknowledge. Obviously, BP has a bit on its plate at the moment. That being said, someone at BP is updating the official Twitter account. At the least, acknowledge the account to your followers so that they know it is fake. It’s also important to not backlash against the @BPGlobalPR account but rather open up some dialogue and let them know that you’re aware of its existence. 3. Monitor & Respond. It appears that the originator of the @BPGlobalPR account is on a quick mission to sell some BP Cares shirts. They’re managing to build a quick following with witty, clever tweets. Tweeters and bloggers will eat this content up, and a flurry of offshoot posts and other content is sure to emerge. The best BP can do at this point is stay tuned to the conversation, monitor the follower base and respond and comment when possible. Though it’s a rough position for BP, it’s an opportunity to offer up some quick key reminders to prevent your own brandjacking incident. 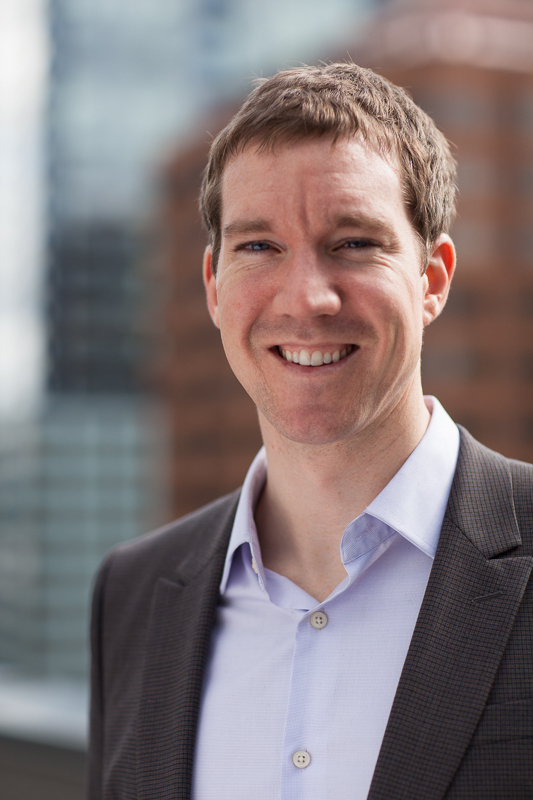 Secure Usernames — If you’re heading up social media at your company or in any way in charge of communications, I highly recommend hopping over to http://www.usernamecheck.com/. The site provides a great overall analysis of common and not-so-common social media sites. Simply type in a username at the top, and let the analysis begin to see where a particular username is already being used. Whether you plan to actively use the username or foresee potential use, lock it down on the most popular social media sites. Think Proactively, Plan Broadly— The endless possibilities of URL and username combinations make it tough to ever create a full protective brand shield. Whether planning for a campaign or updating your crisis-comm plan, think proactively about potential secenarios and the keyword/username slate that could impact your efforts. Have your own advice for BP or general brandjacking prevention tips to share? Feel free to post below! Previous Post What Are You Going To Risk Today?